Sri Ram Ashram feels like a second home. We drove into this magical place feeling excited, but with a sense of nervousness. We were unsure of how the next several days would treat us; little did we know what we were in for. As the bus finally parked, the kids flocked to the door. We were welcomed with warm smiles and genuine happiness. The kids immediately took our hands and led us through the ashram playground, demanding our full attention and arm strength. These kids did not care about our backgrounds, beliefs, or skin color, only that we were there to have fun. And boy have we had fun! 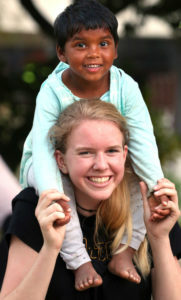 I have met so many amazing kids here. It’s seriously one big happy family. All the older kids look out for the younger ones; they take on this responsibility with grace. It is something that has truly inspired me. It has been a privilege to come here and interact with everyone, I am learning new things about myself every day, and meeting more and more incredible people each hour. The kids are bright, and above all else positive. Laughter fills the courtyard each day, something guaranteed to make you smile. I find myself really admiring their outlook on life, especially considering the circumstances of many of them before they came to Sri Ram. It is truly a breath of fresh air. I am happy that I am here, and feel grateful every day. I will not forget the memories I have made in this beautiful home, and the relationships that I have built with these special people. The Gujjars are a tribal people that live in the jungles of India, and have for a very, very, very long time. They are almost completely self-sufficient, their main commodity being milk, which they trade and sell to the locals of their area, and to people in Haridwar. Sri Ram Ashram has a very friendly relationship with the Gujjars, and have traded milk and wheat back and forth for a long time. 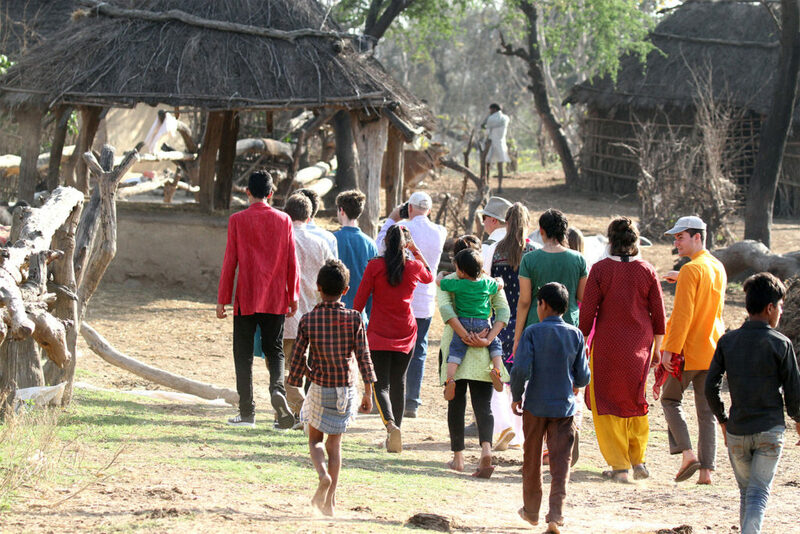 Yesterday, we got to go and visit a Gujjar village that is very close to the ashram. We all piled in the back of a trailer being pulled by a tractor, crossed a canal, and drove forth into the dusty, scraggly jungle that the Gujjars call home. We encountered a little bit of trouble on the way there in the form of two men on a motorcycle who insisted that we didn’t have permission to drive into the jungle, tried to get us to leave, and one of them attempted to pull rank by telling us that he worked for the national parks system in India. Of course, he didn’t know that we were from the ashram, and he had no identification on him to prove who he was, so when he called the village head down to kick us out, we were greeted, and we were allowed by. As we mounted the final rise leading into the village, a large crowd of kids stared at us shamelessly as we pulled up. Rashmi, the woman in charge of the ashram, had explained to us that each family has three structures: one for the women and children, one for men and guests, and one as the kitchen. 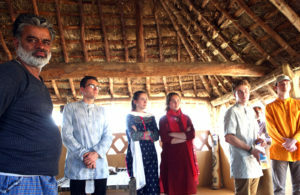 Each structure is composed of walls made from cow dung and mud, and the roof is made of wood beams and grass. While that may sound very simple, the architecture is aesthetically pleasing, and all the huts were well constructed and kept spotless. Each family welcomed us into their homes with shy smiles. Some of the kids feared us and ran off to hide, but several followed us around the whole village, and showed us their cows and livestock. In one hut, we saw a 10-day old baby goat in a cupboard, laying on the family’s produce. Overall, I was blown away by the simplicity of the Gujjar’s lifestyle, and how content they were with it. The lack of stuff was noticeable, and I think that this is a big contributor to their happy and simple way of life.